The mission of the Construction Institute Boston Chapter is to advance the state of construction technology, equipment and techniques. The chapter encourages the advancement of education and research in construction engineering and provides a forum for the exchange of ideas particularly between designers, contractors, owners and other professionals associated in the construction industry. Sponsor dinner lectures and organize guest speakers who represent the leadership and expertise within the construction industry. Provide a forum to debate relevant topics within the profession. Co-sponsor the Annual Francis M. Keville Memorial Dinner jointly with the Transportation & Development Institute Boston Chapter. A scholarship from the Francis M. Keville Memorial Fund is awarded to a deserving graduate student in the construction management program at Northeastern University at this dinner. 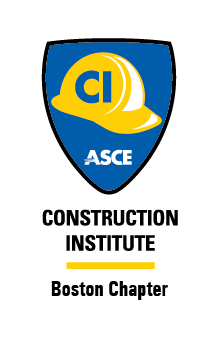 We welcome and encourage participation in the Boston Construction Institute Chapter of ASCE. If you are interested in joining our group or have ideas for future meeting topics, please contact the chair. CI Boston Chapter meetings are often held at Jacob Wirth in Boston once a month; to find out when the next meeting is, contact Sean Homem.